The Subaru you love got a major makeover making what used to be expensive and “wish-list” upgrades now the standard in many vehicles, including the all-new 2018 Subaru Forester Sport Trim. The Forester Sport brings a thoughtful redesign of space and style, becoming the perfect balance of the Outback and Ascent. As one of the most popular vehicle models in Canada, you’ll want to learn everything you need to know about the new standard of driving in the all-new Subaru Forester. There were two inspirations of the new Subaru Forester noted at the International Auto Show in New York. The first and most important was the strong influence of the importance of family. Creating a safe driving experience, proactive solutions and interactive driving assistants is what makes this vehicle a family first vehicle. Don’t take our word for it – just look at the short list of vehicles that made it on the IIHS designation. As one of the few vehicles that have made the IIHS top safety pick for over 12 years, Subaru is bringing safety to the front of its designs. 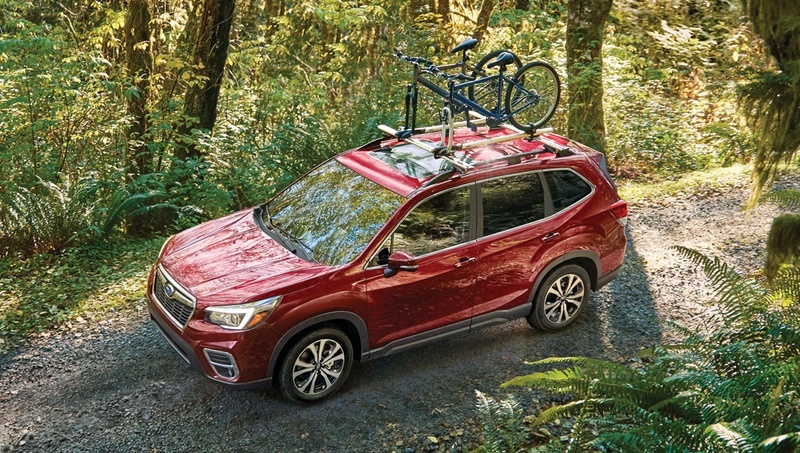 Adding to the spirit of adventure, the 2019 Subaru Forester Sport includes a panoramic moonroof to make everyone feel connected on the ride, especially on off-road, where the fun really starts! No need to pave the path either, with 8.7 inches of ground clearance and standard X-MODE with Hill Descent Control, the sky’s the limit. If you’re an extreme adventure seeker, you can also opt for the dual-function X-MODE that includes settings for snow, dirt, and mud for maximum traction on slippery surfaces. All 2019 Subaru Foresters got the upgrade to the new ⅖ litre flat-four engine with direct injection. What this really means is that this SUV brings the auto-start-stop to help save on fuel while still producing more power with 182 hp and 176 lb-ft of torque. This comes with CVT transmission to include fuel efficiency, meaning less money on gas, and more moves on the road ahead. One of the more preferred reasons people choose Subaru is for its dual compatibility with iPhone and Androids, making both users easily adapt to the 6.7-inch touch screen or for an additional fee the 8-inch screen to access all apps and music. To avoid those notorious data charges, the 2019 Subaru Forester Sport also offers Wifi connectivity, to keep you in touch with the people and information that matters to you. The 2019 Subaru Forester Sport has had Subaru enthusiasts buzzing all of 2018. For now, you can have a virtual tour of our new Subaru. If you want the advantage of the first official tour and test drive, get in touch with our team for updates, to place pre-orders, or to pre-book a test drive.